There are 18 types of mangos in India, I have used green Rajapuri, the seed is small and not fibrous so was very easy to slice. 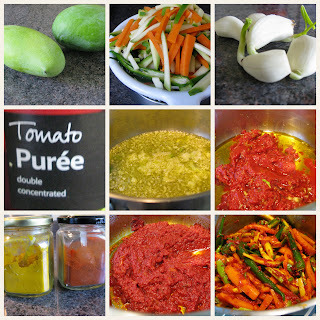 Green Rajapuri mangoes are large and firm and often used for pickle. They are grow in the state of Gujarat. This mango is an excellent source of vitamins A and C.
1. Place the sliced mangoes, carrots and chillies in a large glass bowl, add salt and leave for at least 2 hours or overnight. 2. Drain the above and spread on a tea cloth to dry in the sun if possible for 2-3 hours or overnight if dried at room temperature. 3. Heat the oil in a pan, add the garlic, saute for a few minutes. 4. Add the tomato puree and cook until the paste is dehydrated. 6. When cool, add the carrots, mangoes and chillies mix. Store in the fridge for upto a month provided the vegetables were dried sufficiently.